Hello everyone! Today I’m excited to share with you how I get my free credit report, free credit score, credit rating, free credit protection and free credit monitoring online all from one great credit reporting service called Credit Sesame! I know a lot of people pay to get their credit report and credit score. I’ll show you how to save money by getting your credit report and credit score completely free anytime you want using Credit Sesame. Bonus Read: The Complete Guide to Building Credit! I also know some people pay for credit monitoring and credit protection services. It’s a good idea if you do as most major credit protection companies like LifeLock, Identity Guard, myFICO, and IdentityForce. They’ll monitor all your financial accounts, loans, and credit card activity twenty-four-seven. They’ll alert you immediately of any possible data breach or identity threat. They give you access to all your credit reports and credit scores from the three major credit reporting services. They’ll also provide you with guaranteed insurance of up to one million dollars if your identity is stolen to repair and fix credit, any identity issues, and pay for any legal fees. Even though it’s smart to pay for premium identity theft prevention and credit protection services. I understand that not everyone can afford to or wants to pay a company to monitor and protect your credit. Although, everyone should have some type of protection and credit monitoring! So I’m going to show how you can get free credit monitoring and credit protection from Credit Sesame. 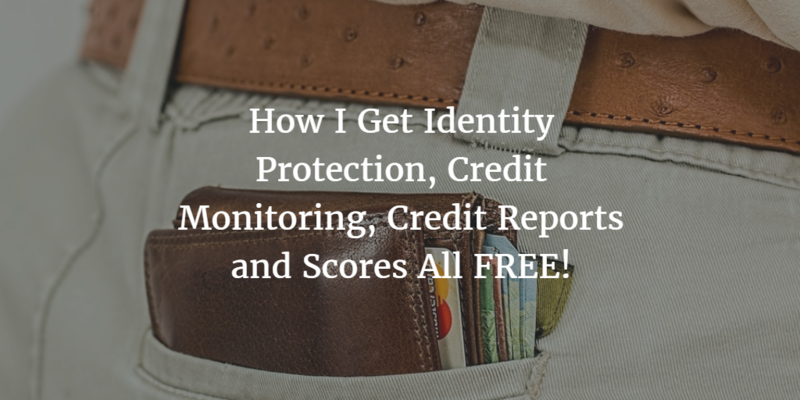 How I Get My Free Credit Report, Score, Protection and Monitoring! I’ll explain exactly how I get my free credit report, score, protection and monitoring using Credit Sesame. This is an amazing free credit service that gives you access to many free credit tools – like free credit monitoring, free credit reports, and free credit scores anytime. I use Credit Sesame all the time, but I’m also signed up for LifeLock’s services. This way I’m able to compare my credit reports on both and make sure there are no errors with my credit. Both services alert me of any changes to my credit or any suspicious credit activity. Although Credit Sesame is free for anyone to use, LifeLock is a premium membership service that I pay for. Since LifeLock is a premium membership identity protection and monitoring service, I do get more protection and many other additional benefits than I get with Credit Sesame, the free credit and monitoring service. Sign up for Credit Sesame now before reading any further and quickly review your free detailed credit report. It’s completely free and it only takes a minute to sign up, so you have nothing to lose! Now that you have signed up for Credit Sesame, view your free credit report and score. Check and review your credit report and credit score. Make sure there are no errors or unusual activity listed in your report. Also look for any suspicious credit cards, loans, and/or other financial accounts listed in your credit report that you didn’t sign up for or open. Credit Sesame will also give you recommendations on how to improve your credit score and access to many other free credit resources. If you want premium credit protection, credit monitoring and check your credit report from all three of the major credit reporting services – you can try LifeLock free by signing up for their free trial. Access Credit Sesame Anywhere, From Your Desktop or from their Android and Apple App. I’m able to always view and monitor my credit report directly from my Credit Sesame Account. What’s even better about viewing your free credit report on Credit Sesame is they give you a much more detailed (action packed) and organized credit report. They called it your “Free Credit Report Card,” because it has more bells and whistles than a regular boring credit report. Free Credit and Loan Analysis – View all of your credit information. Credit Sesame gets all your credit and loan information from TransUnion, which is one of the major credit bureaus. Using this information, you’re able to track and manage all your loans, debts, credit accounts, and other important financial information in your report. Free Credit Monitoring – After I signed up for Credit Sesame’s free membership, I really liked how they sent me monthly update of my credit score and credit monitoring. Save Money – Credit Sesame has their own patented analytic engine, which analysis’s all of my credit and debt on a daily basis. It then shows me where I can save money on things like mortgages, loans, credit cards, student loans, and many other things. Credit Card and Loan Offers – Credit Sesame makes recommendations on what credit cards or Loans are best for me personally and ones that I’ll most likely be approved for. Connect with Others – Credit Sesame has a large community for its member’s to help and interact with one another. There are many other great free features and credit tools available to you on Credit Sesame. Learn more or sign up for this great free service at the Credit Sesame website! Get Identity Protection and Your Credit Report FREE Now! Great advice on how you can indeed obtain all this information from free. With the vast number of credit repair scams operating it can be confusing and difficult to know who you can trust to provide you with a credit report. If you end up deciding to use a credit repair company to help improve your credit score you need to make sure read their reviews and ensure they’re accredited with the BBB too.